Allergy season is here in North Carolina. After living here for three allergy seasons I can assure you that allergies are no joke. We have 37 60 foot+ pine tress on our property. Which means every spring we go through a few weeks where everything is coated in yellow pollen. It's disgusting being outside and miserable if you're allergic to pine trees like I am. I'm a mom of three very high energy children . They don't like being inside and I don't like it when they don't burn off their energy. Plus I'm a special ed preschool teacher, there is no staying indoors to avoid the allergens for me. Besides if we stayed indoors we would miss out on fun activities like strawberry picking. I know the only way to survive is to start my allergy medicine early. This way it's already in my system when the pollen starts to drop. I also come home and shower if I've been outside for too long. A few weeks ago I took my students on a walk through the wooded area at our school. My black shoes turned greenish yellow that day from the pollen and I literally shook off a cloud of pollen when I moved my shirt. I knew I was covered and I wanted to wash all the pollen off. There's nothing worse than going to bed and getting the allergens on your pillow and sheets. In addition to my usual allergy medicine, I started using nasal spray this year. I don't know what took me so long to take the pharmacists advice on nasal spray, but it really works. You really take for granted being able to breath through your nose until you can no longer do it. Learning how to treat my allergies took me a long time to figure out after moving to North Carolina. I didn't have allergy problems in Vegas like I do here. Turns out if I had just gone to a doctor or RN right away I could have saved myself some suffering. Avoiding allergens is the best treatment option, it's not always practical or even a realistic option. 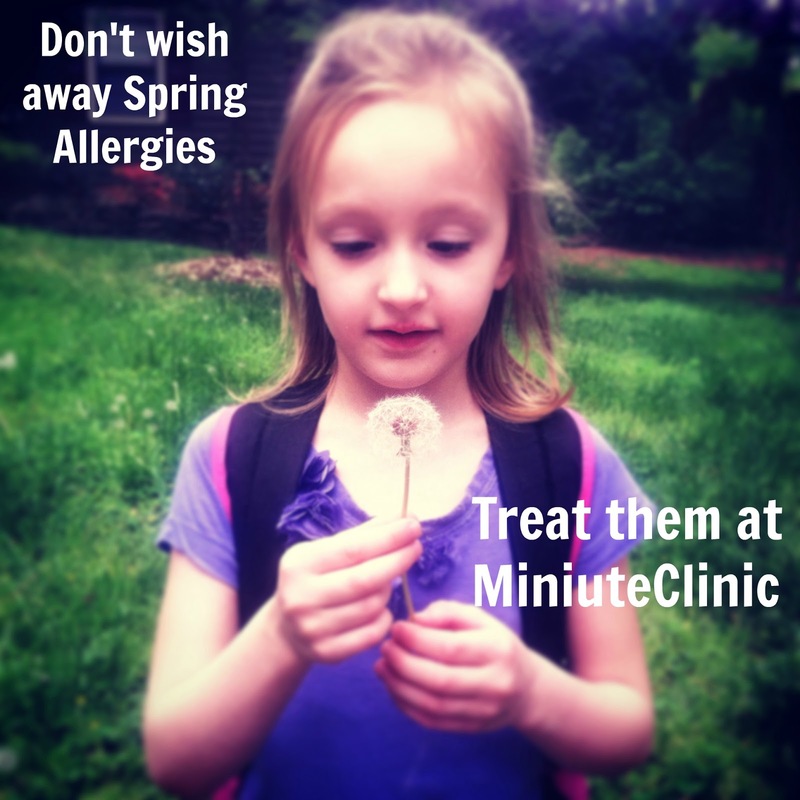 When avoiding your allergens is not an option, head to MinuteClinic. Their nurse practitioners and physicians assistants can recommend the right over-the-counter medications and write prescriptions when medically appropriate. Here are some tips from MinuteClinic to help you survive allergy season. 1. If you're like me and you know you suffer from allergies start taking allergy medicine a few weeks before your symptoms start. 2. It's impossible to keep your kids from coming into contact w/ pollen, but it is possible to get relief - fast! 3. Shake it off! Before coming inside, rid your clothes of pollen with a good shake. 4. Did you know hair gel could be a pollen magnet? Skip the sticky stuff during allergy season for a little extra relief. 5. Avoid window fans! While convenient, they tend to bring in unwanted pollens or mold spores. 7. Pull out the shades! Sunglasses protect your eyes from pollen, while keeping you looking stylish at the same time. 8. Fall asleep on clean sheets. Wash your bedding every two weeks to help ease allergy symptoms. For more information about allergies you can visit your local MinuteClinic at CVS. They are opened 7 days a week so you can visit when it's convenient for you.